After having visited the Netherlands in the past, I was aware of their advanced cycling culture, but arriving on this study tour was a real eye opener. For those of you who don’t know me, I am the founder and chief campaigner of the Stayin’ Alive at 1.5 campaign. This is a campaign which pursues the adoption of a law for Ireland which would require motorists to give cyclists 1.5 metres when passing from the rear. Education plays an important part in this but overseas experience sees this message crystallised by the law. (In 1975, The Netherlands’ southerly neighbours, Belgium, passed this into law). (Yes I wear Lycra. For those who don’t understand why, well, for longer distances it’s simply more comfortable and saves a fortune in Sudocrem!). I arrived in the Dutch city of Utrecht having been in France cycling with other Wexford cyclists and completed a 180km at 32km/hr average in an event while there securing a gold medal in the process. This is the type of cycling I do for leisure. My commute involves a 3km spin across Wexford town where I encounter a meagre 20 metres of cycle lane. The rest is on shared roads with motorised vehicles. Cycling infrastructure in Wexford is scarce, mostly unjoined and therefore mostly unused. What commuters there are, mostly choose the relative safety of the footpath. Wexford doesn’t have much of a congestion problem so the advantages of cycling to work are not as obvious as for more densely populated areas. This excellent Dutch cycling study tour was like arriving in another planet. Everywhere we went, the infrastructure was there to make cycling as safe and pleasant as possible. It was great to see how the Dutch had gotten to this point; how they solved roundabout safety, how they created cycle streets, how they build their cycling lanes using 3cm thick red asphalt (as opposed to our thin layer which creates a lumpy surface after a few years), how they joined up their thinking with secure bike parking etc. Indeed everything that could possible make bike riding as comfortable, safe and convenient as possible. I like to people watch and seeing how the Dutch interact with these facilities was a joy to behold: Secondary school kids cycling from school shooting the breeze, flirting, joking and laughing. Small children out cycling with a parent chatting away. People in general chatting to each other. People going about their daily business whether it be shopping, meeting others etc all done from the comfort of a bicycle and moreover without the associated stresses of interacting with hurried traffic. I also didn’t witness the proliferation of overweight and obese citizens we in Ireland have become accustomed to. While in Utrecht, I spent three great evenings with my nephew who was over from Oxford Uni for a conference. I ended up in a few student type establishments with him. It was perfectly natural for the students to cycle to and from these places. I’m not sure what Dutch laws are about having a few beers and cycling but it seems like common practice there. Now I compare all this to what I witness in Ireland. How can we get from where we are at to this cycling utopia and all of its inherent benefits? Where we certainly need to start is to increase funding for connected cycling infrastructure greatly and do so on an ongoing basis. We need to stop rolling out landmark, costly unreasoned infrastructure. We know we don’t have to reinvent the wheel here. The Dutch seem to have it nailed and mostly it should be copy/paste. In the meantime there needs to be a huge education drive to kick start a paradigm transport shift. We certainly need a safe passing law and probably some form of presumed/strict liability law to keep current cyclists cycling and to add the sense of security and safety to encourage others until we have our own infrastructure in place. Regarding the cycling-while-intoxicated laws in the Netherlands: Officially the same limits apply for driving, cycling or even (on public roads) walking, but in practice they are literally never enforced for the latter two groups. If I’m driving (in the UK) I will never have a drop to drink because it’s not worth it. But of course we have no laws about “drinking and walking”. In almost every way cycling is somewhere in between driving and walking, but the energies and weights concerned are much closer to being on foot. I feel the main way cycling is closer to driving is due to the arbitrary decision to put bikes in the carriageway, and consider them “vehicles”. Perhaps if we removed pavements and forced pedestrians to walk in the road we would have “walking under the influence” laws? 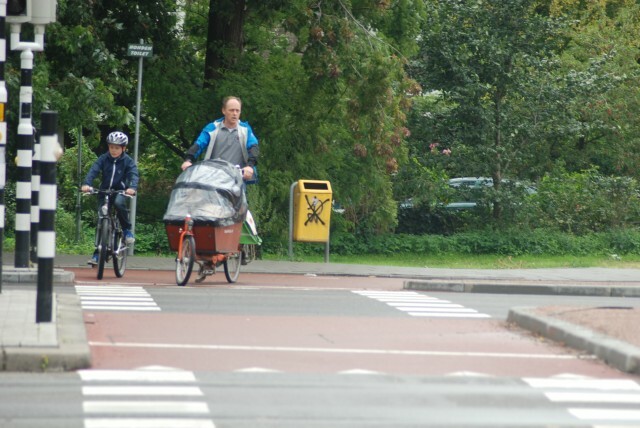 Back on-topic, great to read how the Dutch cycle-infra appeals even to those of us who are at the sportier end of the spectrum. Totally agree we should be “copying and pasting” a lot more. Thanks for sharing your experiences. One day I was cycling on a bike lane. A truck driver had parked his truck on this bike lane to unload. To be able to pass this truck I had to move from the cycle lane onto the road. The car driver behind me braked and waited to give me the opportunity to pass this truck. After I had returned to the bike lane the car passed me.